As a kid, Halloween may have been your favorite holiday of all time, but when we get older, it seems to lose some its magic. However, Halloween doesn’t have to be all about trick-or-treating, and adults can have just as much or even more fun than kids do. All you need are the right accessories, food, drinks and Halloween beer gifts. While the holiday has nothing to do with it, October marks the mid-autumn season when it is time to harvest an abundance of delicious vegetables, and nothing speaks of this more than the pumpkin. At the same time, this month has traditionally been reserved by many cultures, including German, Austrian, and Bavarian, for the popular beer celebration known as Oktoberfest. In the U.S., we tend to combine Halloween harvests with the beer festivals of the Old World, and several specialty beers are brewed featuring seasonal grains and fresh hops. Hundreds of seasonal beers hit the shelves in October, and all of these autumn favorites are even more special when they are served at a party attended by close friends and family. What is even better, however, is when the beer is a gift that comes in packaging designed for the occasion and is accompanied by an assortment of sweet, salty and savory snacks. 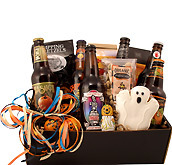 At BeerGifts.com, we carry a full selection of Halloween beer boxes that include some of the top Autumn beers from U.S. craft brewers. Pumpkinhead from Shipyard Brewing has been popular year after year, and Punk’n from Uinta Brewing in Salt Lake City has been a favorite since it was first crafted in 1993. Other tasty selections that make great gifts include Black Jack Porter from Left Hand Brewing Company and Dead Guy Ale from Rogue Brewing, which is unlike any beer you have tasted. 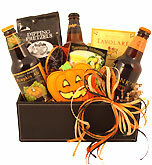 In addition to Halloween beer gifts, we also carry Halloween beer baskets at BeerGifts.com. If you want to treat your beer-enthusiast friends to a present they will always treasure, a black leather growler cover is just the ticket, or for those with simpler Halloween tastes, a Pumpkins Brewin’ pilsner glass hand painted as a jack-o’-lantern may be in order. Is it about time to turn up the heat in your life? If so, you may want to give yourself a shot of cinnamon and hot peppers in the form of Voodoo Ranger Atomic Pumpkin from the New Belgium Brewing Company. This special-release beer was designed to put a fresh spin on the pumpkin beer craze that hits the world every fall, and the New Belgium brewers definitely know how to do spicy pumpkin just right. Authentic habanero chili peppers, pumpkin and Saigon cinnamon, are added to the brewing process along with heaps of Munich, Pale Rahr, Caramel and Pale Mena malts, so you can expect nothing less than a spicy party from the first sip to the last. If you're wondering why the hops were left out of the party, rest assured that the brewers threw in just enough Nugget to balance out those sweet malts. 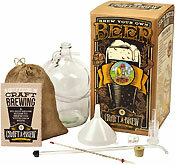 They also added high-quality California ale yeast to pump up the volume on flavor with this unique pumpkin brew. When you take that first sip, expect those sweet malts to come forward first. You can then enjoy the kick of spice created by those chilis, but it all ends with a note on the sour side. With an ABV just over six percent, this is the type of beer that may allow you to enjoy more than one bottle without falling out of your chair. Do you know those days and nights when you want to reach for a beer that you can really feel? We're talking about feeling the warmth deep in your gut as you drink as well as feeling the lingering effects of a big night come morning. Wake Up Dead Imperial Stout from the Left Hand Brewing Company is the beer that you want to reach for on those occasions. It offers bold flavors of coffee, dark chocolate, licorice and raisins while keeping the ingredient list dark and powerful. Magnum and US Goldings hops ensure that you have a delightfully bitter finish to every sip, and a blend of Chocolate, Munich, Crystal, Black and Roasted Barley, Flaked Oats and Pale Two-Row malts make sure that you're rewarded with something sweet as well. The brewers hold each batch of Wake Up Dead in their cellar for at least four months before sending it off to consumers, so you're assured that something deep and dark lurks in every bottle. Buffalo Bill's Brewery opened to the public in 1983, and they created their first batch of Pumpkin Ale in 1985. This makes it not only one of the most established breweries in the country, but also one of the first to create a delicious ale based on the flavor of pumpkin. Most breweries have jumped on bandwagon by now, but you can consider a bottle of Buffalo Bill's Pumpkin brew a true original. It's only available from July through October, but the pumpkin pie aroma and spiced up flavor is certainly worth the wait. Real pumpkin is the foundation of the recipe, but it also includes the traditional spices that you would expect from a pumpkin-esque beer. As you watch the golden ale fill your glass, the aroma will take you back to Thanksgiving Day as the pumpkin pies warm in the oven. Consider it your holiday in a bottle. If you ever get the chance to visit the Shiner Brewery in Shiner, Texas, you'll order this brew by requesting "Shiner 97." If you stick to the bottles that are available in your own hometown, you'll come to know it as Bohemian Black Lager. You may even come to think of it as one of the best black beers on the market if you enjoy malty flavors and dark beers with an incredibly smooth body. It's also worth noting that this brew has won 12 awards, including five medals from the Australian International Beer Awards and four medals from the Great American Beer Festival. First brewed in 2007, this is a brew that you can stock up any season of the year, so consider it your new best friend when you want something dark, warm and deliciously comforting. The Ballast Point Brewing Company took their Piper Down Scottish Ale and added a ton of pumpkin with a delicate balance of seasonal spices to create their version of a pumpkin ale. They call it Pumpkin Down, and it adds a bold new flavor profile to the fall brews typically released from August to November. Since this brew features a deep orange color, it's the perfect addition to a Halloween party or to any meal that needs some added interest. The flavor is ripe with pumpkin, but it also tastes a bit like pie in a glass because you can detect a bit of apple and cinnamon. Patrons at the Ballast Point brewery are wild about this seasonal brew, and that enthusiasm was shared with others when it picked up a bronze at the 2016 World Beer Cup. Think of pumpkin ale as a pumpkin pie in beer form. While Pumpkick is seasoned with cinnamon, allspice and nutmeg like most other pumpkin brews, it offers an unexpected kick from the addition of cranberries and lemongrass. This creates an interesting flavor that starts out as rich as the best pumpkin pie in town and finishes with just enough sour to keep your taste buds craving one more sip. It pours into the glass a rich amber color, and the off-white foam rises to the top with delicate lacing. You'll notice the aroma of pumpkin pie right away, but sniff a little deeper to pick up on the sweetness of fruit and a pleasant floral accent. This spiced seasonal ale is available in the fall for only a couple months, so start looking for it around August.